A popular, attractive, and truly easy-care plant, the Pothos has smooth and leathery heart-shaped leaves. They adapt easily to all environments and will grow quickly with minimal care, a perfect addition to refine any desk or shelf. This is currently sold out. The pothos plant is widely considered to be among the easiest and most forgiving of plants to care for. 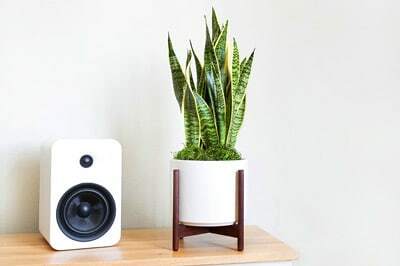 It grows vines that can be trimmed or arranged to create a lush mini-jungle, and is a terrific purifier of indoor air. Follow the instructions below and you should not have problems with your Pothos. The Pothos thrives in areas with medium light, but is adaptable and can even handle low light. Be sure to avoid prolonged exposure to direct sunlight as it can burn its leaves. The Pothos needs to be watered about once a week, but always check the soil first to see if it's dry. Do not water if soil is still wet. The best way to give it water is to take the plant out of the decorative pot, thoroughly water it and let all the excess drain before putting it back. As with all plants, avoid overwatering and drain any excess water from the bottom of the pot, as standing water may cause root rot. If the plant is overwatered the leaves will get brown and wilted, if it is underwatered it will droop and eventually dry out completely. Feel free to trim away any dead or dying brown leaves by cutting them off at the base of the leaf's stem with sharp scissors. Write us at hello@leonandgeorge.com with any questions about your Pothos not covered here.